The warm weather is here and Beltaine is nearly upon us! Every year, Pagans come together around the first of May to celebrate fertility, sexuality, love, and new life. What better way to celebrate than with flowers? Indeed, May Queens of old were often decked out with floral crowns, and the tops of Maypoles are sometimes decorated with the latest blossoms. 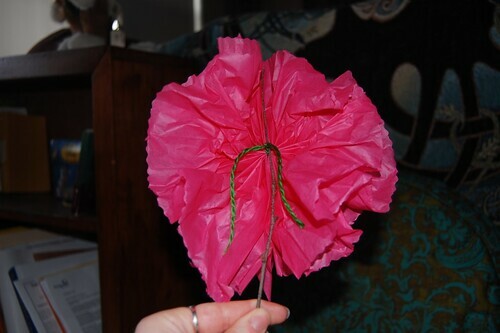 Although using real flowers is a great way to learn about and work with local Nature Spirits, it’s also fun to make your own using tissue paper. This is an easy activity to do with children especially if you don’t have access to local, pesticide-free blossoms. 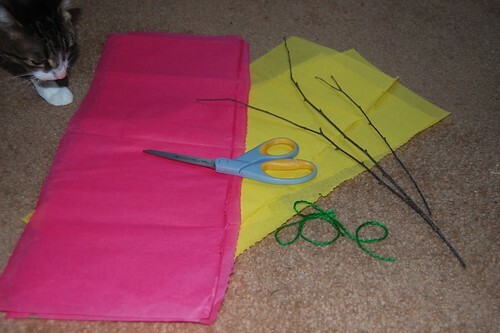 To make these flowers, will need tissue paper, scissors, yarn, and twigs. You can forgo yarn and sticks for pipe cleaners but I want to throw mine into the bonefire as an offering. Yarn and sticks will burn better. I chose birch twigs as they symbolize new life (I keep a variety of sticks around the house…). 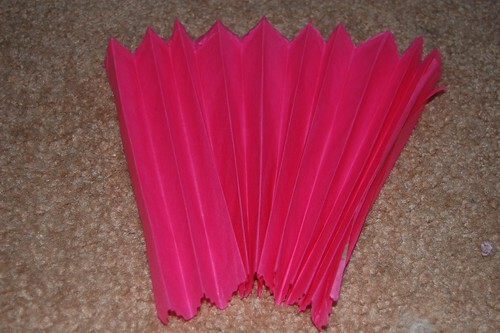 Take a sheet of tissue paper and cut it into thirds or fourths. They don’t have to be perfectly straight. 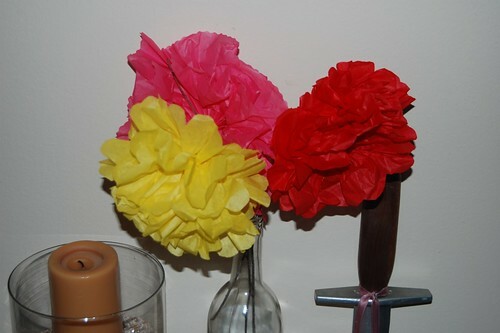 Rough edges can also add personality to your flower – part of what makes this such a child-friendly craft. After cutting a sheet of paper into thirds, fourths (or whatever), pile them on top of each other and fold accordian-style. If you want your edges to be even, trim them now. You can also round the edges out. I had a difficult time here because I went for a smaller fold and had more paper to cut through. Still – when the flower is finished you’ll hardly notice! Take your yarn (or pipecleaner) and tie a knot in the middle. Here’s where I add a little magic. Visualize goals for the coming season (being a Druid, I chose three) and make a knot for each. 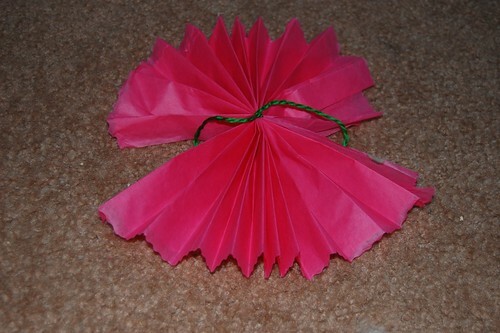 Pull the top and bottom corners towards each other in an attempt to make a circle. 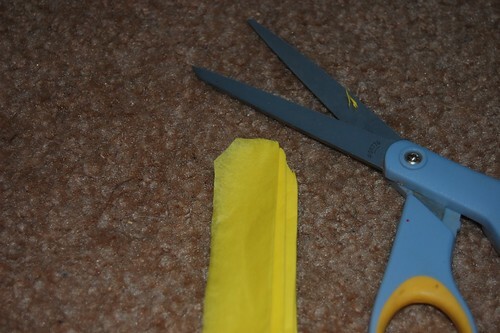 Then carefully separate the layers of tissue paper. Move some forward and some backwards. Although the flowers I made to offer (in the first photograph) were made with one color each, you can combine paper to create all sorts of stunning varieties. Mine will go into the Beltaine fires as offerings and wishes to rise to the Kindreds. I intend to bring other gifts as well, but I felt the need to work a little magic. I’m all about mixing magic with arts and crafts. This would be a great opportunity to talk to children about magic and the holiday. I am amused that someone else knows how to do this. 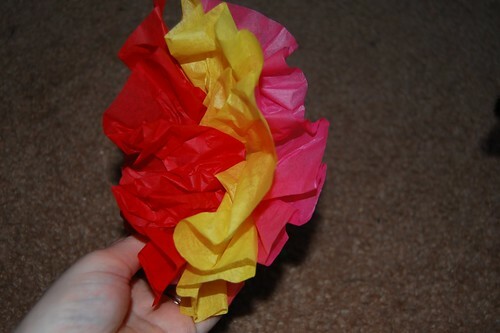 My mother taught me how to make these when I was a wee child. 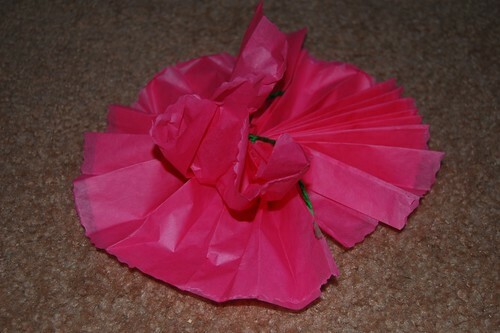 Also carnations out of tissues. It is fun making stuff like this.